On Saturday afternoon me and 10,000 (30,000?) 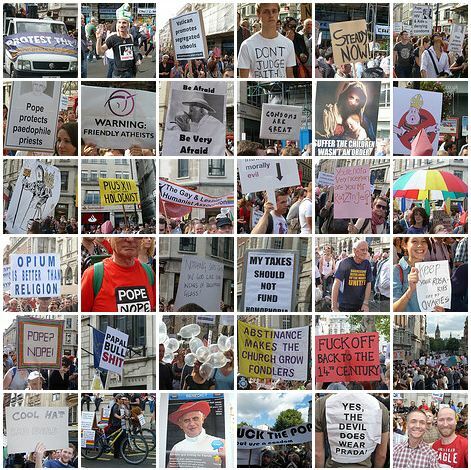 other people marched down Piccadilly, through Trafalgar Square and into Whitehall to protest against the Pope's state visit to Britain. Lot's of inventive signs were on display. * That the Pope, as a citizen of Europe and the leader of a religion with many adherents in the UK, is of course free to enter and tour our country. * The state of which the Pope is the head has also resisted signing many major human rights treaties and has formed its own treaties (‘concordats’) with many states which negatively affect the human rights of citizens of those states. * As a head of state, the Pope is an unsuitable guest of the UK government and should not be accorded the honour and recognition of a state visit to our country.